We Exist in Japan Now! After a ten-hour flight (complete with an incessantly screaming child), we weren’t quite sure what to make of our arrival in Japan. As the plane finally pulled into the terminal, the windows were pulled down, and it was still quite dim inside. It felt like we still could have been anywhere. Following such a long flight, it couldn’t properly hit us that we were actually in Japan. We could have been flying over the United States the past ten hours, for all we knew. Our sense of arrival didn’t set in until we finally stepped off the plane. Immediately upon entering the airport, there was something different about the very atmosphere. It was clean, quiet, and very orderly—a departure from the expected large crowds and noise. Everything was calm and efficient. Although Japanese was everywhere around us, signs posted in multiple languages made the transition much smoother than it otherwise could have been. After making bathroom and currency exchange runs, Tanya, Natasha, and we (Cody and Ryan) waited for everyone else to arrive in the airport. Little did we know that they were waiting only a couple of hundred feet away. Once the two groups finally discovered one another, there was little time to waste. With our fearless leader, Chad, at the helm, we all jumped on a bus to the Sakura Hotel, where we would be setting up shop for the coming month. 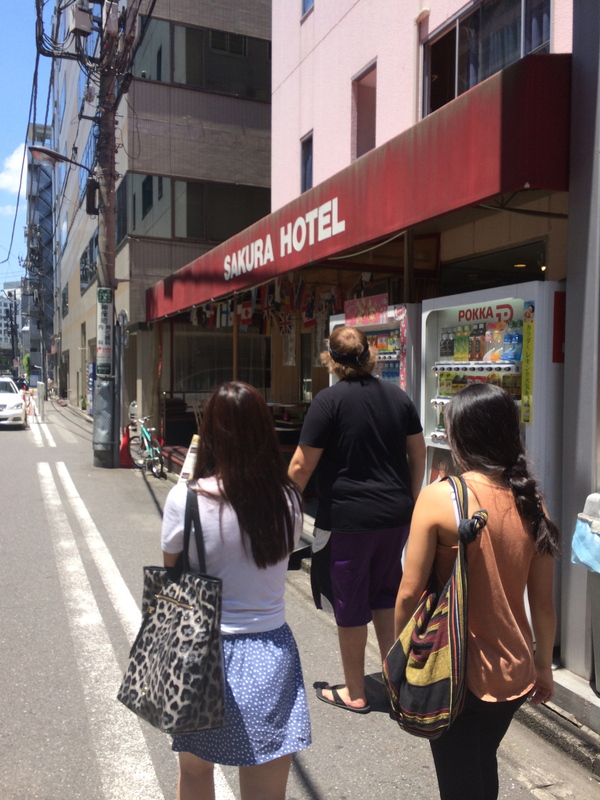 At the Sakura Hotel, the first thing we noticed was that everything seemed to be compacted or shrunk to fit the minimal amount of space needed, especially compared to the spacious American standard of living we had all been used to. The chairs seemed smaller, the beds seemed smaller, and the rooms were definitely smaller. In addition, the shower and sink setup is not what some of us had first expected. Rather than being set up in each room, they were set up by floor—a set of two sinks and two showers to be shared by everyone. Also, the shower had a mirror in it, which was more than a little disconcerting the first time you step into it. The toilets are interesting too. As you turn the knob to flush, a little sink on top of the toilet comes on for you to wash your hands. Convenient, but as usual, no towels are provided. Overall, though, the Sakura Hotel is a pleasant and convenient place to live. And it really defines the ideas of Japanese compactness and economically small living. As soon as we were settled in our quarters, it was right back out on the streets again to go and find somewhere to eat. As we set our eyes on the surrounding Jimbocho area it was clear we wouldn’t have any trouble fitting right in here. The incredibly clean and spacious streets (and sidewalks) were lined in every direction with cozy little shops and restaurants. After walking a little ways down the street, we stopped in at a place specializing in sukiyaki and other similar foods. It was definitely a new experience—instead of standing in line or sitting down to have your order taken by a waiter or cashier, we simply put our money into a machine that resembled a little toy vendor, and pressed the button for which dish we would like. We were then issued a ticket, which was placed on the table to give to the cook/worker, who then brought the food out to you to be placed on a heater for you to cook yourself. The whole process really fit into the increasingly present motif of efficiency. 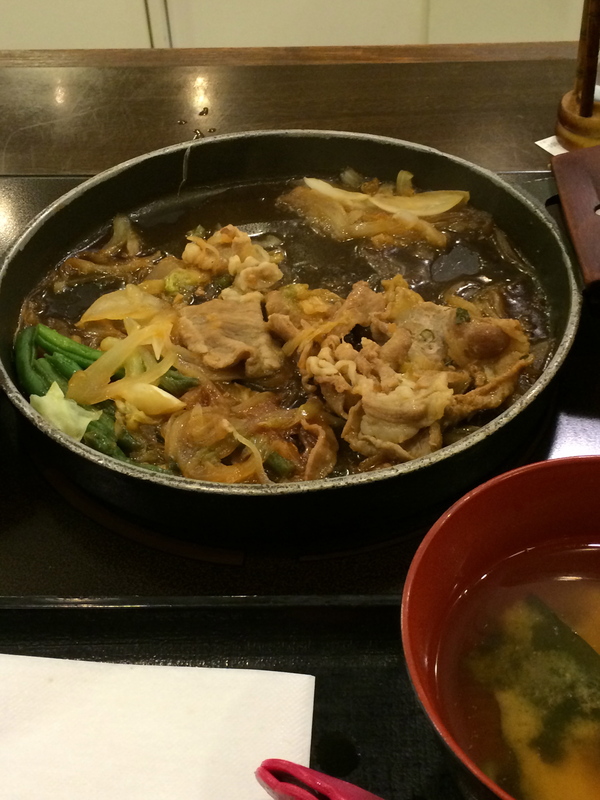 Some of us got the traditional sukiyaki, and others ordered something similar to pork shogayaki. As we walked back to Sakura Hotel (stuffed full of delicious food) we all really started to get our bearings among the streets that, only a few days later, already feel familiar. Exhausted from traveling and still getting past our jet lag, we all went up to our rooms to catch some much needed sleep before our first proper day of experiencing Tokyo. 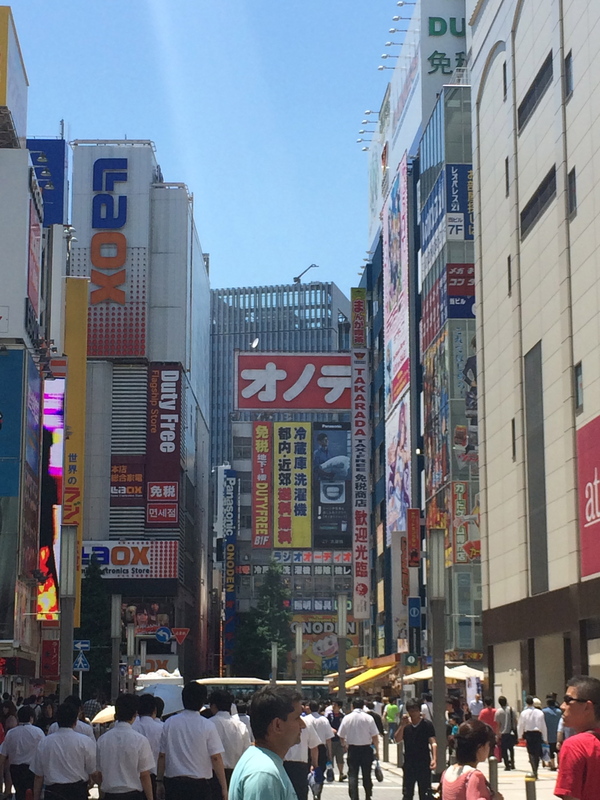 The next day (Sunday, June 15th) was our first full day to really get to know Tokyo. All of us set off around noon for Akihabara, a major shopping area known particularly for electronics and manga/anime culture. Before jumping into the (massive) stores, we grabbed a quick lunch at a great curry shop. As expected, the curry was delicious, and the restaurant was the same kind of setup as the night before- pay, push a button for whatever meal you want, then sit down and present your ticket to the person behind the counter. Afterwards, we explored a giant shopping center full of electronics called Yodobashi. After that, we stopped by Uniqlo, and you could definitely tell that many of the Japanese in the store were regulars, or at the very least dedicated Uniqlo fans—they were all wearing Uniqlo, and it was definitely interesting to walk by a shirt on display, and see the person standing right next to the display wearing the exact same clothes. After that, we stopped by another place called Don Quijote. It was a largely AKB48 (a J-Pop group) themed store with a seemingly endless continuation of levels, with the top floor (though it was off limits when we visited) being the place where AKB48 members perform live. The store was definitely fun to explore—there was every kind of trinket imaginable, from hair curlers and perfume, to takoyaki makers and stickers for your Suica card. 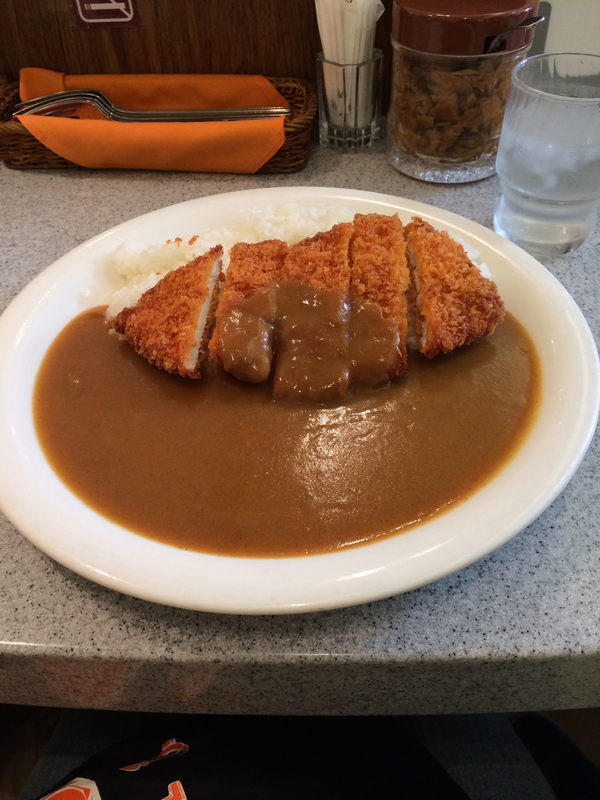 Our Akihabara lunch: Katsu Curry! After taking the trains back to the Sakura Hotel from Akihabara, we all took a little breather. Some slept, some read, and some ate. A little while later, after some much needed rest, we regrouped and marched off in search of dinner. We settled on an Udon restaurant called Hanamaru. Afterwards we set off to explore the area. In the process of familiarizing ourselves with our new home, we actually stumbled upon Meiji University, our host university. It was “a-meiji-ing!” And it was a fitting end to our whirlwind introduction to Tokyo.